Life is messy…it can be really messy. I’ve found the trick is to find the message in the mess. Not always easy, but doable and rewarding. Why even look for the message you ask? To find the gifts that are presented to you. My dad had significant health issues since my mom died, but we were able to keep him at home for six years (with help) until a serious illness landed him in the hospital. That’s when the real nightmare began. In the 20 months that followed, Dad was in the emergency room eight times, admitted to the hospital four times, and had lengthy stays in the local physical rehab facility three times. We had to move him into a “memory support unit” in the local assisted living home, sell the house and eventually bring in the hospice team to help us all inch toward the final transition. There were many sleepless nights, oceans of tears and months of chest pains as I watched my beloved father slip further into an ever-deepening well of illness. Our family watched in horror as prayers didn’t seem to work, medicines failed and alternative methods did not produce the outcome we so desperately wanted. It was easy to feel sorry for myself, believe that the situation was “unfair and unjust,” and allow myself to be stuck in the circumstances that continued to reel out of my control. Hours spent pacing hospital hallways, speaking to medical personnel and sorting through mountains of paperwork only added to my hopelessness. I decided to look at the situation a different way. While it’s prudent to be mindful of the past and ready to step into the future, the real beauty of life is in the NOW. I learned this while spending time with my dad just as he was at any given moment. No, Dad wasn’t the brilliant businessman I’d grown up with, but he became softer and (depending on where he was in his process) utterly charming, funny and quite witty. He was usually the darling of whatever medical team had charge of him at the moment thanks to his sweet nature and sly smile…that was not the dad I had known. This was a different version of Dad and when I could release my expectation of what Dad “should be” or worse, what he “was going to be” I allowed myself to thoroughly enjoy him in the moment as the beautiful being he was. Everyone has their own unique journey. Although I would not have chosen this path for my dad, I came to understand that it’s far more loving to respect his experience than fight against it. Yes, I worked with my family to ensure Dad had excellent care and the most optimum healing environment possible. And we worked with his care team to manage his options, but I learned to allow Dad to experience his journey without trying to “fix it” or make it the experience I wanted it to be. I learned to respect the creative force in my father and trust he created the “perfect experience” for him. It was my job to create my own perfect experience in this situation. Each individual plays a part in the life of everyone they touch. 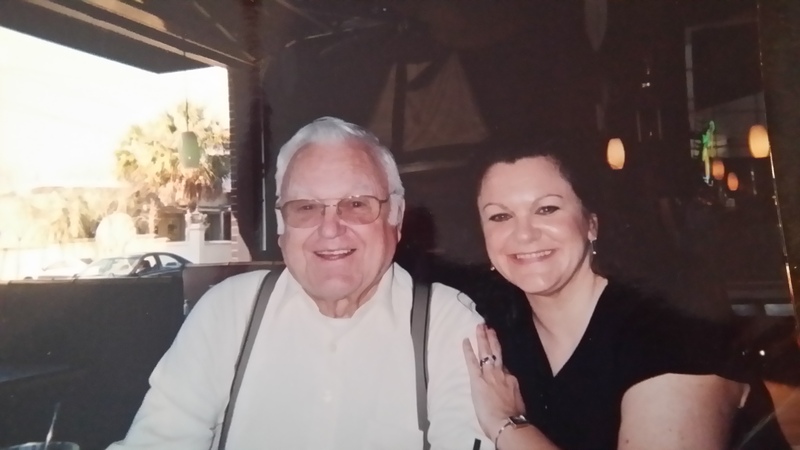 I came to understand that throughout his life, Dad touched many more people than I realized. I know how “important” he was to us growing up. He was a WWII hero, his business fed our family, he was active in local government, served on volunteer boards and supported charities. But that was before. How his spirit orchestrated things during this time amazed me. His critical health situation brought my brother, sister and I closer. My husband and I learned to support and love each other on a level I never knew existed. Dad enriched the lives of dozens of people who reached out to us to offer assistance or to tell us stories that showed us a side of him we never knew. His caregivers, nurses and doctors said seeing Dad was the “highlight of their day” even as his health steadily declined. He continued to touch everyone he came in contact with or who know him through us, until he finally passed peacefully from this world to the next. I guess the real message for me is about the energy of life that lives in each of us. And how that energy continues to evolve throughout the human life cycle in ways I never truly understood. I see how inter-related we all are and how only through the eyes of love can we really see the truth of any situation. Most importantly, I realize the true essence of my dad, and all of us, shines through illness, pain and even impending death. What a message. Thanks, Dad….